Automate anything using macros with this powerful yet easy to use app. 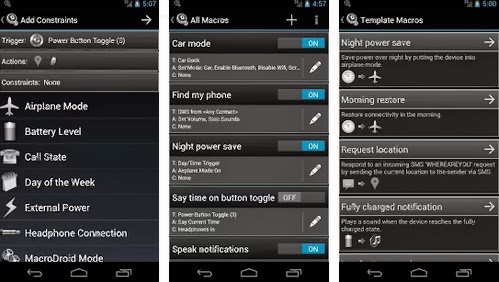 Download MacroDroid Device Automation PRO 2.3.1 Full Apk and make your life a tad bit easier. MacroDroid is a task automation and configuration app that focuses heavily on usability with a simple, attractive UI and logical step by step process. Please note MacroDroid is currently only available in the English language. Preliminary work is underway on a Spanish translation which we hope to make available in the coming months. • Shake the device to upload the last photo to Facebook. • Turn on Wifi or Data connection when you launch a particular app (and off again when closed). • Respond to an incoming SMS by sending your current location. • Toggle the power button to tell you the time (e.g. when its in your pocket). • Use NFC tags to configure the device (turn on bluetooth, set volume etc). • Select a trigger from a list - (e.g. Battery Level). • Add more constraints as required (up to 10). • Choose a name and category for the Macro. MacroDroid includes a list of template Macros to demonstrate the power and flexibility of the application. These templates can be used as is, or customised to meet your needs. 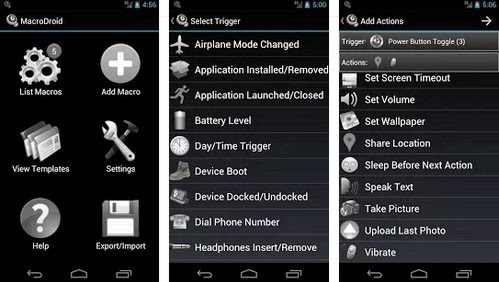 Airplane Mode Enabled/Disabled, App Installed/Removed, App Opened/Closed, Battery Level, Bluetooth Event, Day/Time, Device Boot, Device Docked/Undocked, Dial Phone Number, Headphones Inserted/Removed, Location Trigger, Media Button Press, Mobile Service Status, NFC Tag, Power Button Toggle, Power Connected/Removed, Regular Interval, Screen On/Off, Shake Device, SMS Received, SMS Sent, Widget Button Press, Wifi State Change. Added Mobile Service Status Constraint. Fixed issue with Notification Trigger on 4.1. Added wave options to proximity Trigger.